While visiting the Nanfeng kilns in Shiwan the temptation to trying out traditional press moulding myself was of course irresistible. It was easy to fall in love with this well prepared clay. I felt I could easily have settled down here, making flowerpots for the rest of my days. 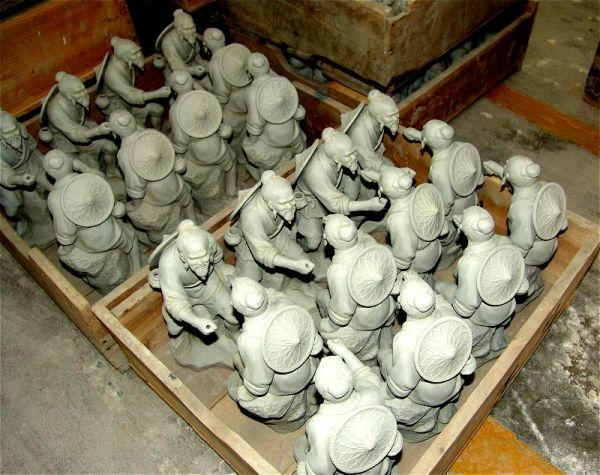 which were the largest of the many pottery factories in the city of Shiwan specializing in figures. 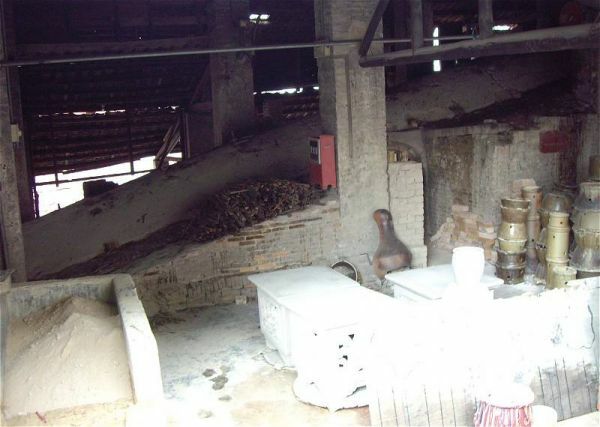 The afternoon was spent studying the Nanfeng kiln complex where ceramics was still fired in the traditional way in wood fired dragon kilns. China's economic opening and reforms that started under Deng Xiaoping in the late 1970s put the Guangdong province in general, and the Pearl River Delta region in particular to national prominence. The main reason was its close proximity to the western foothold of Hong Kong. Given the opportunity the region quickly went back to its old open minded roots of brisk international trade and quickly became a world leader in terms of production, exports and foreign direct investments however on a bit wobbly feet. The various cities in the Pearl River Delta Region subdivided the economic activities and Guangzhou became a leading center for knowledge-based services, including domestic logistics and distribution. Shenzhen, closest to Hong Kong is the most export-oriented city, a leading transportation and logistics center and also a domestic financial center. 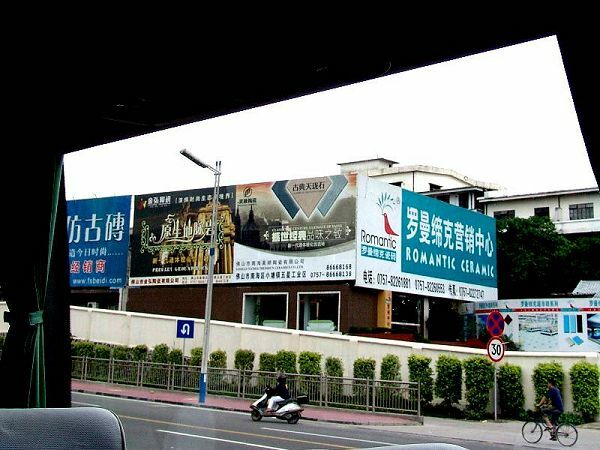 Dongguan just in-between the two became the export workshop and is also from where much of the selling to the domestic market is organized. Finally Foshan, Zhongshan and Zhuhai on the Western side of the delta, is mostly light industrial manufacturing for the Chinese domestic market and also where we find the Shiwan pottery, today an important ceramic production center. In the 17th of July, 2006 I finally was in the position to set off to visit the city of Fushan. 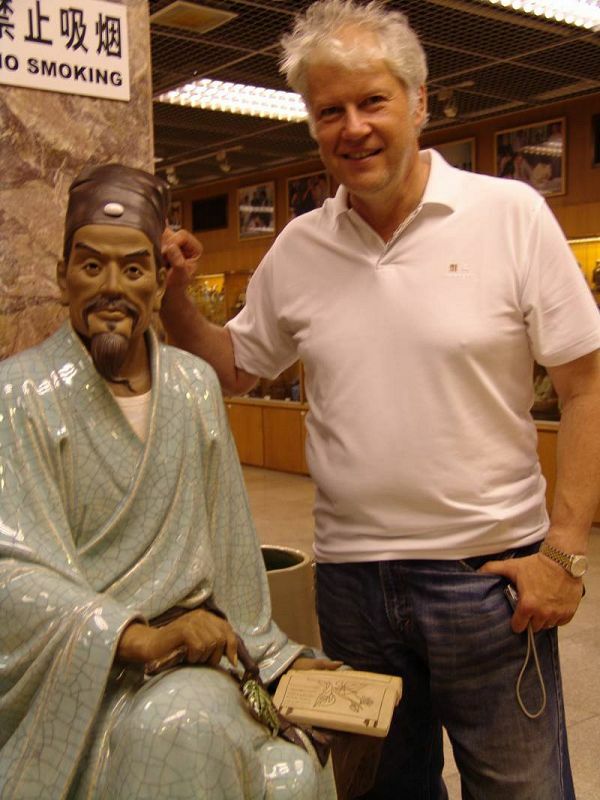 To explain my personal interest for the city of Fushan, I need to go back to the period of the Swedish East India Company trading between Sweden and China in the 18th century. In trying to understand the details of this trade it was important to remember that the western buyers that came here to trade was forced to stay outside of the city of Guangzhou. While businessmen in the contemporary Europe, were living very much within the walls of any city, and being highly respected in society, the social standing of a businessman in China was quite the opposite. In a Confucian society, businessmen were of the lowliest possible rank. This and some well founded suspicions about the true intentions of the "foreign devils" was one of the reasons why trade with the westerners in Guangzhou was kept outside of the city walls. This together with the fact that the foreign trade was quite substantial with 10, 20 or maybe 30 ships every year arriving and going, and trying to find a cargo to bring back to Europe in as short time as feasible, the amount of merchandises to transport, finance and store were enormous. Every ship could load about 500 metric ton of commercial cargo; this times maybe 20 western ships annually would call for the merchants to somehow deliver some ten thousand tons of cargo to be manually produced, handled and exported every year. Now, if you were not welcome inside the city walls, where could you possibly store all this? The answer, or at least a clue, I found in the Swedish report Chinas Handel, Industry och Statsförfattning (The Chinese Trade, Industry and Government) by C. F. Lilejvalch, Stockholm 1848, in Fushan. "A city situated only 3 Swedish miles from Canton, by the name of Fashan (sic), is not much less than the province capital in size. Here are manufactured a multitude of merchandise for the market of Canton. And in particular there are the huge warehouses of local products, which is why the merchants in Canton will go to Fushan to fetch a merchandise when sold for export. The traveling between these 2 cities are so vivid that around 8,000 – 10,000 persons are traveling back and forth on a daily basis. This is why you observe Fushan merchant boats on the river coming and going, filled with people and merchandise. As a comparison the daily consumption of rice in Canton is estimated to more than 2 million pounds and the city does not have more of this than for one week's consumption. The warehouses for rice is also located up the river." To be in this same stream - or wild torrent - of merchandise being transported towards the harbor of Guangzhou once again but 150 years later than observed by the Swede C F Lilejvalch, was a bewildering experience. One interesting observation regarding Foshan is that it was generally known as Lingnan City of Art, where Lingnan - south of the ridges - is the larger Guangdong area including all the provinces making up the mostly autonomous region of Southern China until around the 10th century. It had the reputation for 'satisfying the five senses and ten colors under the heaven'. According to the local legend the pottery that had made the Shiwan area famous, has to a large extent, been made by a small number of pottery families or clans only. And these families, also according to local legend, a long time ago, moved to the area from the "Kingdom of Qing" "after having made a pottery army with large figures and horses". It is today quite obvious that what the local legend was referring to was nothing less than the Terra Cotta Army of Qin Qi Huangdi, the first emperor of China. The time of the migration southwards was as for so many other Chinese looking for business and avoiding conflicts around the 10th century. At this time the Song dynasty relocated to the south and found its new southern capital in Nanjing. The move southwards of the financial and intellectual center of China had a vast impact of the development of southern China and the potters of Shiwan were by far not the only ones to relocate southwards. An interesting thing to speculate about, is what these pottery clans could have been doing in the meantime between the first century up until the Ming period when they were firmly established in the Shiwan area. What comes to mind when looking at the characteristic stunning realism we find in both the terra cotta army and the pottery figures of today, is a 'missing link' feeling regarding the Tang dynasty ceramic sculptures. 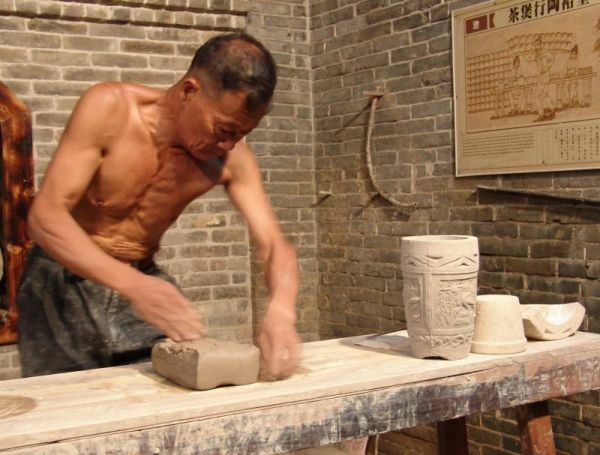 It's a very special quality that we find in Tang dynasty pottery that seems to be a little bit too good to be made by somebody else who just happened to be 'expert potters'. As late as 1959 it was called Foshan and recognized as a center of Cantonese opera, and handicraft where the specialty was to economize with raw materials in producing for the vast export market. Also the colorful glazes that embellishes the Shiwan pottery was sourced from scrap metal oxides from the other Foshan handicrafts and industries. Here all kinds of wares was imitated in cheapest possibly way so that fruits, bamboo decoration and gilded tree was imitated in papier-mâché and so on. In an 18th century Swedish travel diary from Canton, it mentioned that someone one day was fooled to buy a smoked ham 'that later was found to have been made of wood'. From the context it could be possibly that Foshan was the origin of that ham. The ham might well have been a shop decoration, much as we find today - who knows what the crazy westerners want to buy? 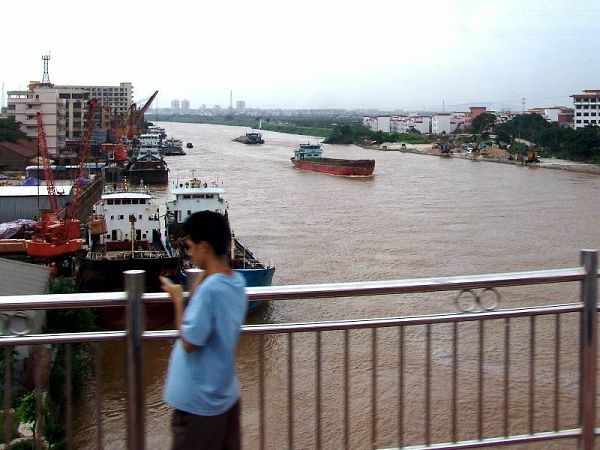 The Pearl River at Shiwan (Fushan) after about one hour of driving towards west from Canton. One of the items made and exported from the Foshan area, of particular interest to me, was earthenware from a nearby place called Shiwan. This is also the origin of one among collectors of Chinese porcelain in general, little known type of pottery, which however on and off has come in my way. It is very charming by itself but has quite a different expression as compared to the cold functionality of porcelain. Shiwan pottery have over the years been collected under several names, such as 'Shekwan' (Shek=rock in Cantonese) or 'Kwangtung'. Having never been in demand by the emperor is also traditionally been sneered at and considered a "low-grade fake Song dynasty looking kind of ware" and of no particular interest. However, to those who like ceramic art for its own sake this is indeed a very charming peoples ware, well worth looking into, with its own history and its own masters. Interestingly enough this popular appeal has obviously been the case for a very long time. Even when looking through the excavated cargo of the East Indiaman Gotheborg which sank just outside of the home harbour in Gothenburg, Sweden, in 1745. Among all porcelain shards, there occurred a small number of small glazed pottery figures, kind of cute, but of an uncertain origin. It took quite awhile before it dawned onto us that it must be Shiwan pottery. So, it was with quite high expectation I started off in the direction of Foshan the 17th of July, 2006. The roads were on and off not more than an ambition in a general direction due to the extensive road works. But since this was what we had to work work, we drove on. In a short while, no doubt, considering the speed of which everything moves in China these days (except the traffic) the infrastructure will soon be ready and offer a much smoother ride to Foshan. It is obvious that Foshan's importance as workshop is as important as ever. Compared to the fiercely overpopulated roads, the rivers were almost devoid of ships. It is not an unlikely guess that as the development continues, the rivers will soon be used to its full capacity again. After about one hour of traveling from Guangzhou we approached the modern Foshan city Shiwan ceramics Factory number One, established in 1956. From what it appeared this was the most important, maybe the only factory, that specialized in decorative pottery figures in the traditional style. All other factories and ceramic industries we had spotted afar from along the road around seemingly specialized in more industrial ceramics such as roof tiles, facade tiles and floor tiles etc, which was different from the Shiwan figures and artwork I was interested in. Much of the Jars called "Martaban" jars were from all probability also made here. These large south Chinese jars were sold through the Burmese port of Maraban (Martaban) from which Chinese pottery and porcelain of all types was exported to all Asia and Africa from the Song through the Ming dynasties. Suggested dates of this type ranges from the 8th to the 18th century, which might be too short a span. In the Ming and the Qing dynasties Shiwan continued to produce the daily wares it was famous for, but their products took a turn to include art. 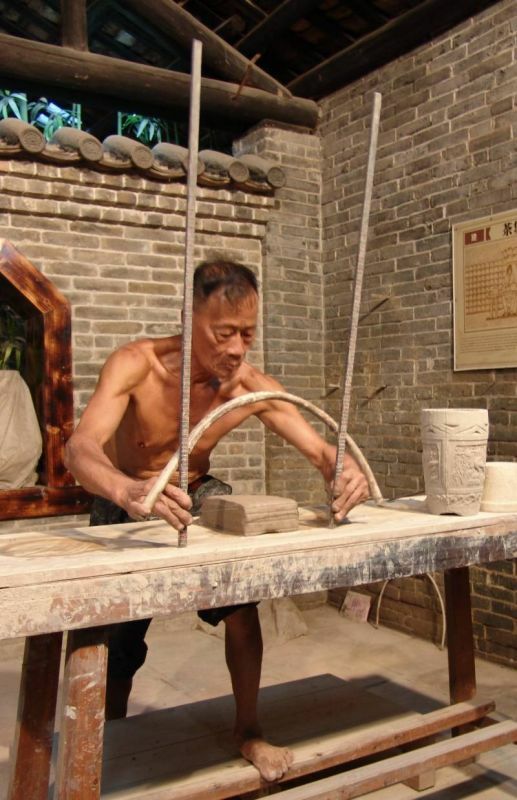 In the Qing dynasty, the kiln produced large quantities of architectural ceramics and sculptures of fishermen, wood-cutters, farmers and scholars as well as daily utensils such as bowls, saucer dishes, and jars, and ornaments such as washers, flower pots and archaic vases. 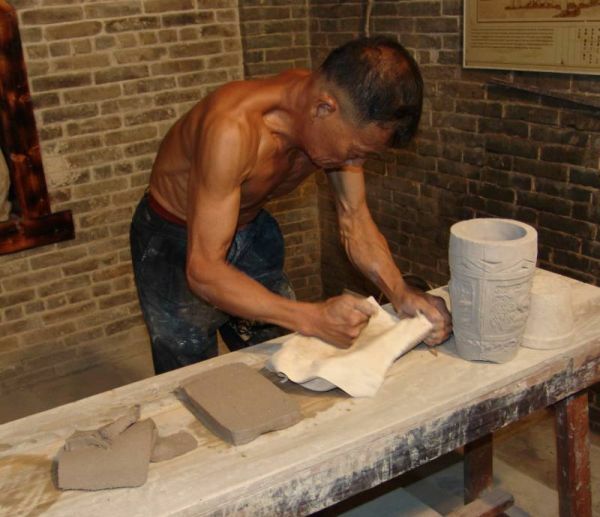 From late Ming until the late Qing dynasty the products often bear the signature of the workshop or the potter. As is often the case many later products are just imitations of the older so a close eye needs to be kept on quality as well as style of any individual potter you are looking for. They are good imitations of Jun ware and also known as the Jun ware from Guangdong (guang jun). 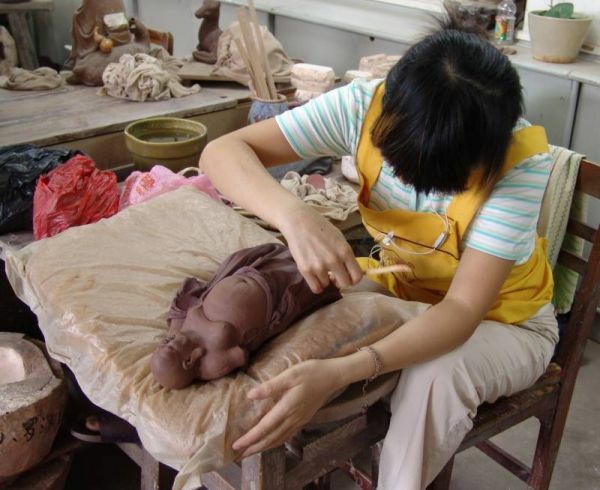 Since the body is of coarse clay, it is also called the earthy Jun (ni jun). The Jun ware has only one layer of glaze but the guang jun has an additional base glaze. The glazes are blue, rose purple, ink black and kingfisher feather color. Beside utilitarian wares it was the artistic figural pottery sculptures that brought Shiwan to fame. The best ones were based on keen observation of common men as well as historical figures and figures as represented in the Cantonese opera. 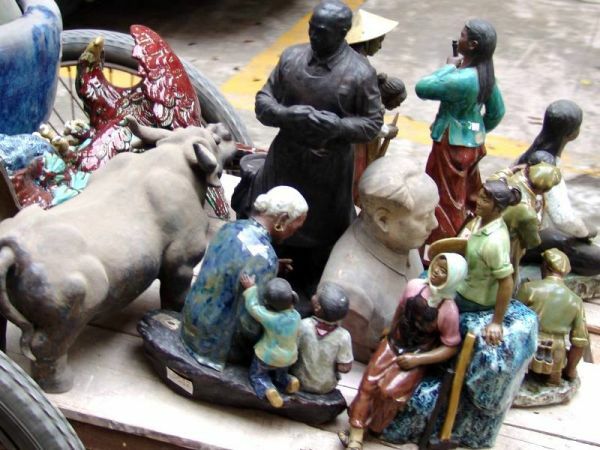 The figures came from Chinese history, folklore and philosophy. The portrayal qualities in these figures are so large that it has been suggested that one way of distinguishing earlier figures from those made after 1949 is by medical diagnosis's that for earlier figures show signs of malnutrition and other ailments that were more common in the earlier society. was a cart load of assorted this and that from a shop window or display. All unmistakable Shiwan pottery. This is how a dragon kiln looks like today. 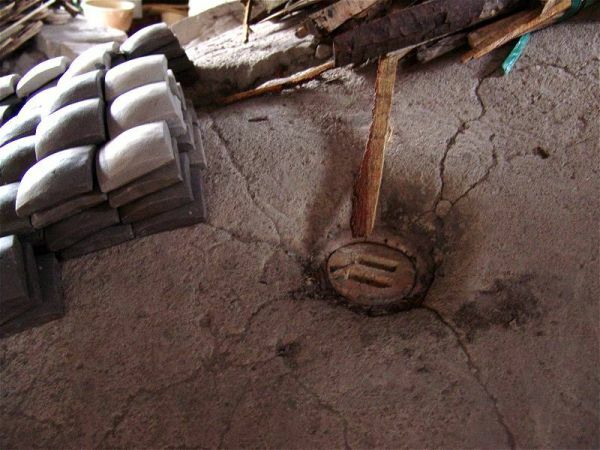 This dragon kiln is used to fire Yixing purple clay ware in Dingshu Town, Fujian province. Built during the Ming Dynasty. It is 48,6 meters (53 yards) long and can fire 7,000 pieces at the cost of 6,000 kg (12,000 lbs) of firewood. It is built like a chimney upwards along a slope. The firing is made at the bottom and along the sides. That way dragon kilns could be built at any length. 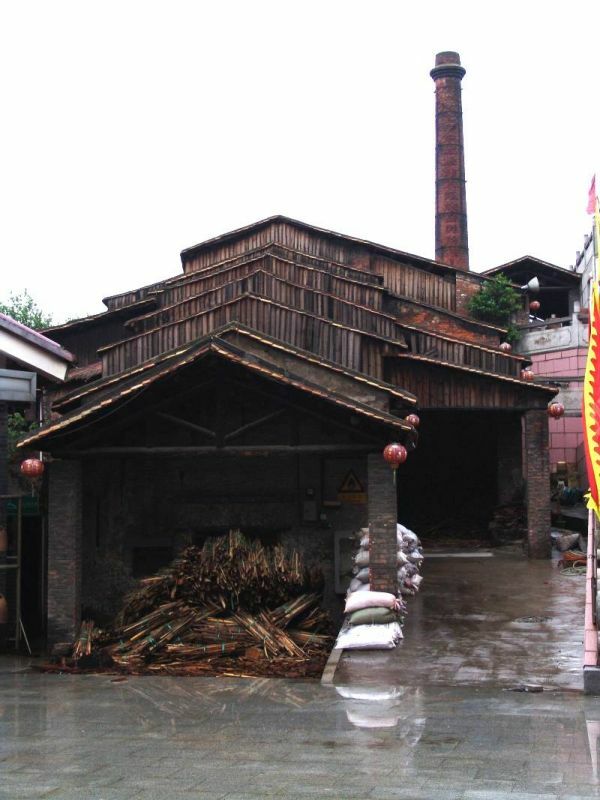 In Shiwan the Nanfeng kiln was fitted with a high chimney at the top end, greatly improving the working and living conditions in the neighborhood. Technically a dragon kiln is built like long chimney upwards along a slope. The type is typical to the south of China and was invented and developed in the South of China during the Warring States period (475-221 BC). This invention was crucial for the development of early Chinese stoneware such as the so called ash glazed "proto-porcelains", since this combined a simple design with the ability to achieve the high temperatures needed. The early Chinese dragon kilns were substantially cooler towards their chimney end. Soon side-stoking ports began to be added. This allowed fuel to be pushed in amongst the pots themselves, thereby boasting the heat in the upper area away from the main firebox. With this system dragon kilns could be build to any length. in Jianshui in Yunnan province, in Rongchang in Sichuan, and in Shiwan in Guangdong province, in the Ming (1368-1644) and Qing (1644-1912) dynasties. Beside these historical locations dragon kilns are still used today in various places to make daily utensils and I guess also architectural pottery like bricks and roof tiles. According to Nigel Wood in his Chinese Glazes p. 35 dragon kilns averaged 10 meters by the first century AD while by the 13th century some examples was approaching 140 meters. In the longest, hundreds of thousand pieces could be fired at one time. Obviously this was ideal for building materials such as bricks and roof tiles but also for all kinds of utilitarian transport ceramics like jars for food transportation and storage that needed to be produced cheaply and in large quantities. The origin of the dragon kiln type, which is basically a long tunnel built climbing upwards along a sloping hillside, is still shrouded in some mists of time. Some claims that this arrangement was adopted already in the Warring States period (475-221 BC), but the pre-Han evidences are scanty and does not suggest that the principle was yet taken very far. A Warring States kiln which is cited as the earliest evidence, was excavated in Zhejiang, near today's Shanghai. 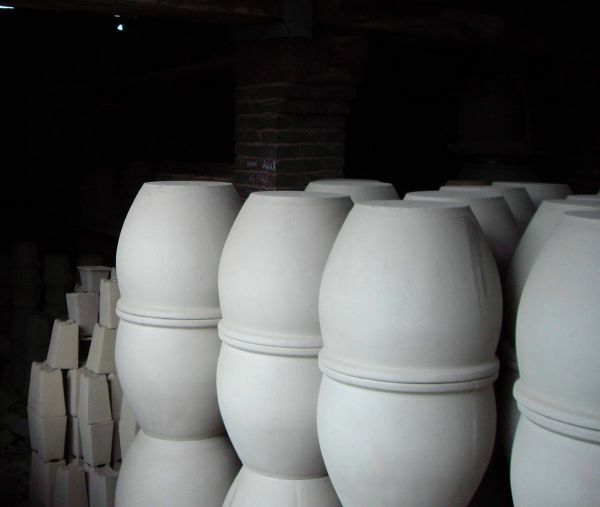 We can be reasonable certain that it was in this region that the dragon kiln type was perfected, and that this took place in the centuries between Han and Tang, meaning in-between 2,200 and 1,300 years ago, and was thereafter adopted as a standard in the ceramic industry in China until modern times. 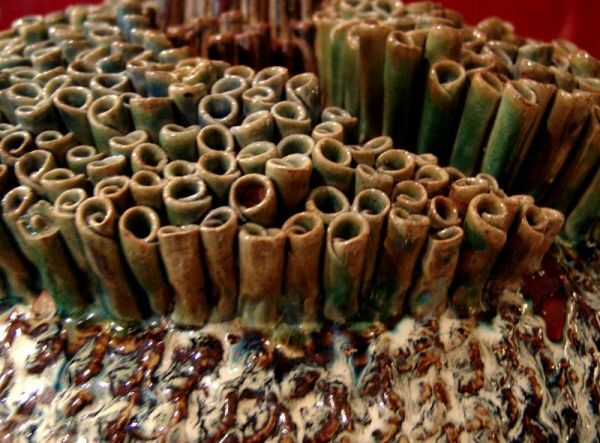 The dragon kiln type was the crown of the early Chinese ceramic industry. 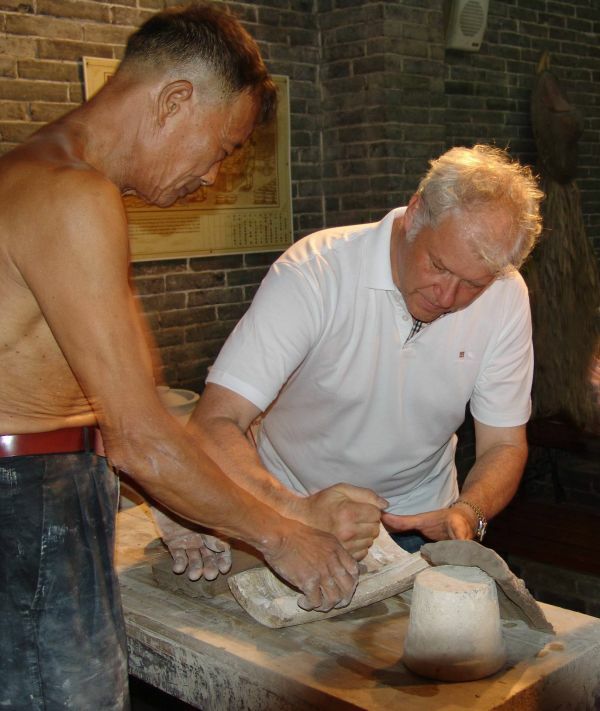 From a very general point of view the ceramics industry in China was during the Stone Age predominantly located along the middle course of the Yellow River and along the Wei River into Shaanxi. During the bronze age and emphatically from Han times there were a remarkable concentration of ceramics industry in north Zhejiang. Not until the rise of the porcelain city of Jingdezhen in Jiangxi province during the Song dynasty, was the primacy of the northern Zhejiang area to be challenged. During the Song dynasty the war with the invading Mongolian tribes the Imperial court was forced to move to the South of China. With that move industrial know-how, talent, capital and a brisk demand followed and encouraged the Chinese society to develop fast. Technology combined with better logistics and the necessity of trade to provide funds for the military defence, encouraged specialization and mass production of ceramics. At this time some kilns with distinctively specialized products that appears. The Shiwan wares from Guangdong was one of them while the red pottery from Yixing and the white Blanc de Chine from Dehua also prospered. The Shiwan kiln I visited are the two oldest and most important of the extant historical Shiwan kilns and are actually two, built along the slope of the same small hill. They are built with their mouth facing South to as the catch the South wind, hence the name Nanfeng (Southern wind) of one of them while this one, the left, listening to the more profane name of, the "High kiln". They were both built in the late Ming dynasty, early 16th century, during the period of the Emperor Zhengde (1505-1521). Both have been in production since they were built however occasionally renovated. The chimney was added after the "liberation", meaning after 1949, and the original thatched roof replaced with tiles also in the Republic period. The firing pit of the High Kiln, Shiwan. Now burnt out and cold. Side view if the Shiwan late Ming period dragon kiln, the "High Kiln". The visit had so far been directed to the city of Fushan, but from Simon Ng's visit to Shiwan a number of years ago, I knew that there still existed an original wood fired kiln somewhere around here, still in operation. 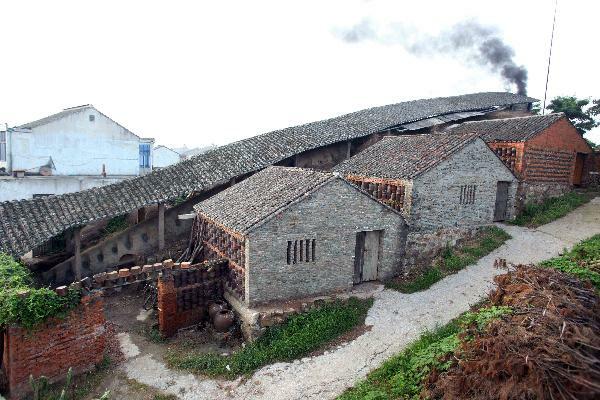 After a brief conversation between our local guide, the factory staff and our chauffeur they told me that - yes - there were two old kilns still preserved and in operation, and they were not too far away. Did I want to go there? Well, yes! After a short ride, we suddenly arrived at the Ancient Nanfeng Kiln. Neatly settled in a modern city environment there were suddenly two quite dramatic looking, Ming dynasty period Dragon Kilns. Each around 30 meters long and climbing up along a small hill in a south-north direction, with the high chimney up towards the north. The kilns were dressed up as tourist attraction with demonstrations of pottery methods and pottery classes for children. But if you thought away the tourist flags that lined the modern stairway, the well manicured greenery, the ticket booth and the inevitable souvenir shop, you could feel thrown back in time, looking at the thin firewood lining the roofs of the kiln with rows upon rows of used clay, unfinished pots and wooden carts scattered around. Strewn carelessly around the site were also antique looking woven grass-slippers (of which I helped myself to stray pair in the name of research and science) used by workers to protect their feet when entering the hot kilns. 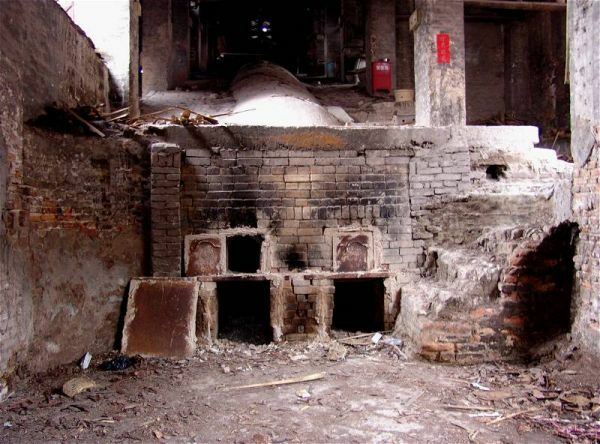 According to the local history both kilns were built during the Ming dynasty, in the Zhengde period (1606-1521) and originally identical. They have both been repaired many times over the past hundreds of years but are still very similar in that they are of about the same size and climb up the same small hill. The High Kiln is 32 meters and has 26 rows of stoking holes while the Nanfeng Kiln is 34.4 meters long with 29 rows of stoking holes. Among the sheds surrounding the kilns were pottery demonstrations held for visitors and I eagerly joined the onlookers. In front of us was an experienced potter who was beyond 60 in years but who hardly looked 50. He enthralled the group with his pottery techniques, showing us how to throw a pot and how to free it from the potters wheel in one floating move, landing it on the nearby table with no visible effort. He supported the pot with pure willpower and it promptly collapsed into a lump of wet clay the minute he removed his attention from it. The feeling from watching this demonstration was similar to watching someone balancing a raw egg - without its shell on a spinning dish. Something one would have thought about as impossible hadn't we just got it demonstrated before our eyes. We were then shown press molding and invited anyone interested to try our hands at it. I of course jumped at the occasion to try my hand at moulding a piece of this soft clay into a pot. In old times the production of different pieces was divided and subdivided into different guilds by methods of making as well as different decorations and shapes. Traditional press molding of pots was demonstrated by one potter that actually let you handle some clay yourself should you want to. The first step in making a press molded jar was to cut out a properly sized slice out of a prepared block of tempered clay, fitting to the intended item. The second pretty straight forward thing to do is to press the clay slice towards the inside mould which gives both the shape as well as the pattern. A number of slices like this could then eventually be put together to a jar. The temptation to try this out myself was of course irresistible and I must say it was easy to fall in love with this well prepared clay. I felt I could easily have settled down here, making flowerpots. It was quite interesting to see how the ceramic production was ongoing in no doubt pretty much the same manner as it must have been for thousands of the years, even though this factory was established in 1956. In the production process in this factory, figures were cast in large moulds of plaster of Paris (gypsum) and the finishing touches were then made by expert artists adding details such as hands, fingers, hats and all kinds of sculpture details. The figures were then colorfully painted to give it full form. 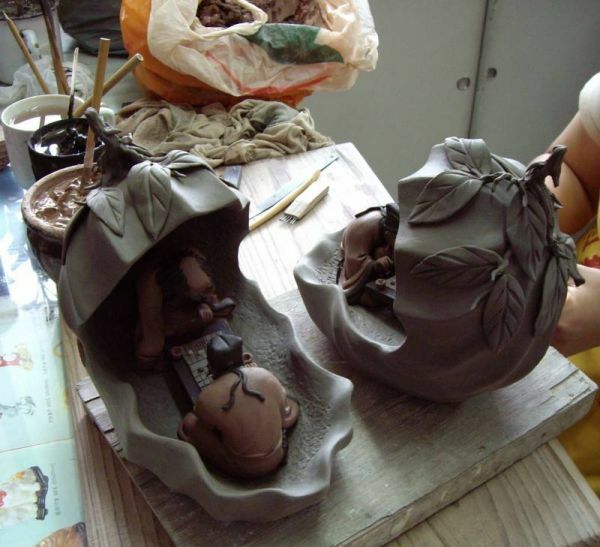 A speciality for one unique artist was to make the moulds in which the figures could be cast, since the moulds were based on a sculpture and it needed quite some precision for mould-making, only after which the figures could be massed produced. 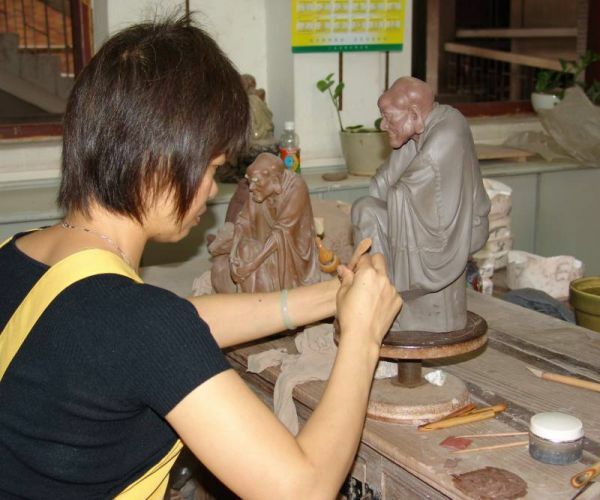 The basic and most fundamental shaping technique for making figures of all shapes and sizes, are casting. 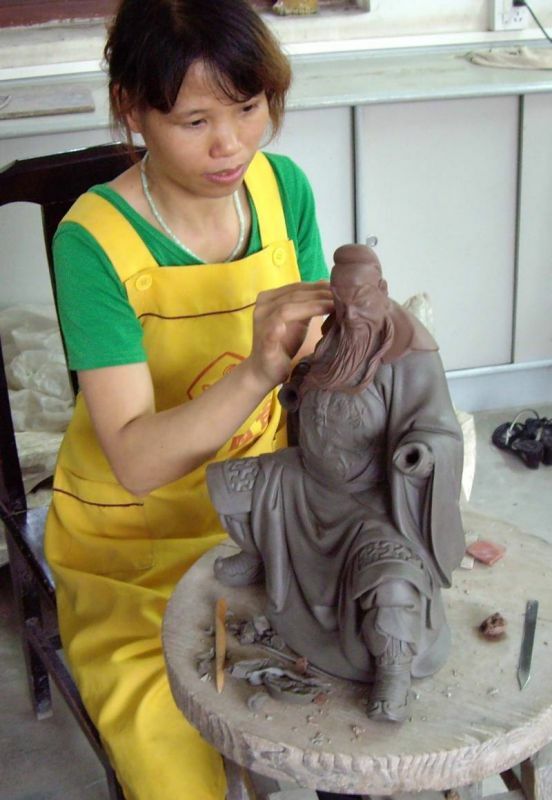 Today the casting in made in moulds of plaster of Paris, earlier when this was not available I would assume that the moulds would be made by pottery clay as in other places where I know that to be the case for sure, such as Jingdezhen. Most figures are cast in several parts and assembled part by part as in these figures where the arms are made separate and added onto the body part of the figures. In this way heads, arms and attributes could be used for several variations. 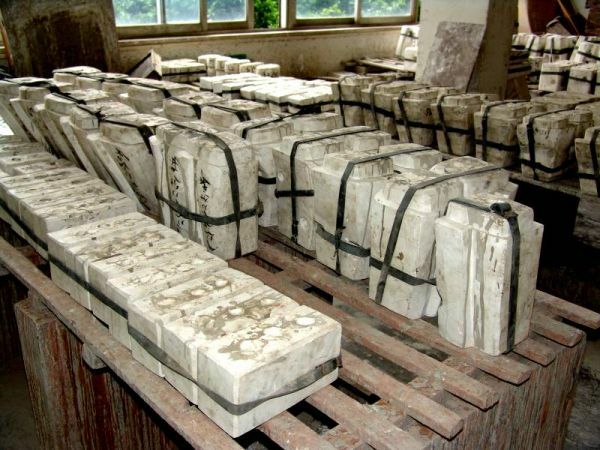 Depending on wear and tear of the moulds some moulds could well be much older than other. 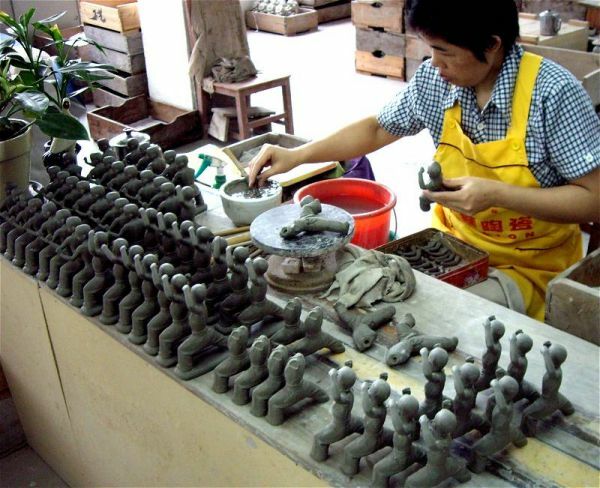 After coming out of a rough mould all figures are shaped and finished by hand. Clays of different colors are typically used for faces and skin tones. However figures intentionally look similar, most figures are to some extent always individual pieces of art. Larger objects could be worked with placed on a cushion. 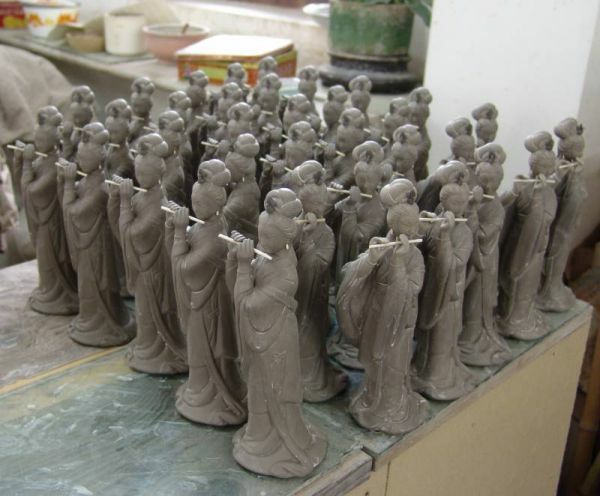 Smaller figures ready to be fired. Small musician figures still not dry. It is charming to notice how some of the figures have been made to look sideways. 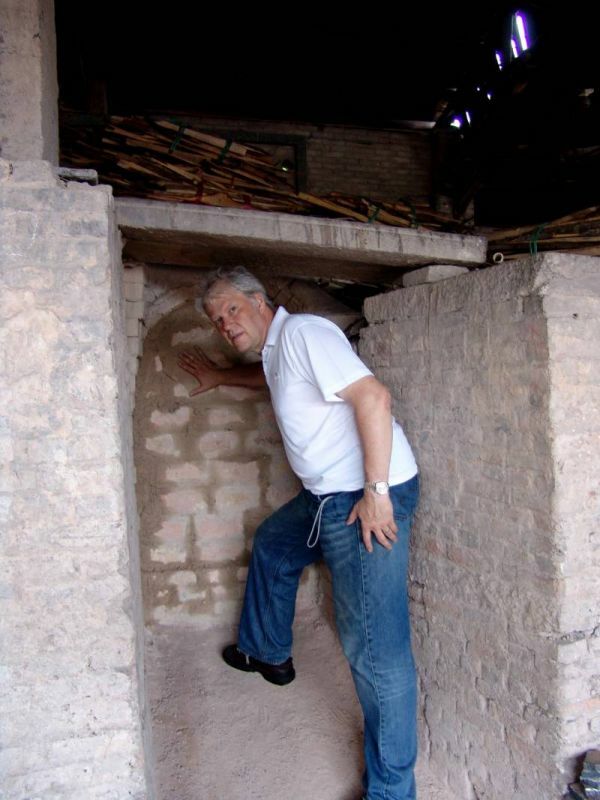 When we arrived, the right most or the eastern of the two kilns was just about to be ready to be fired and there was a worker laying toufu shaped, squarish tiles over the warm kilns in order to help them dry before firing. 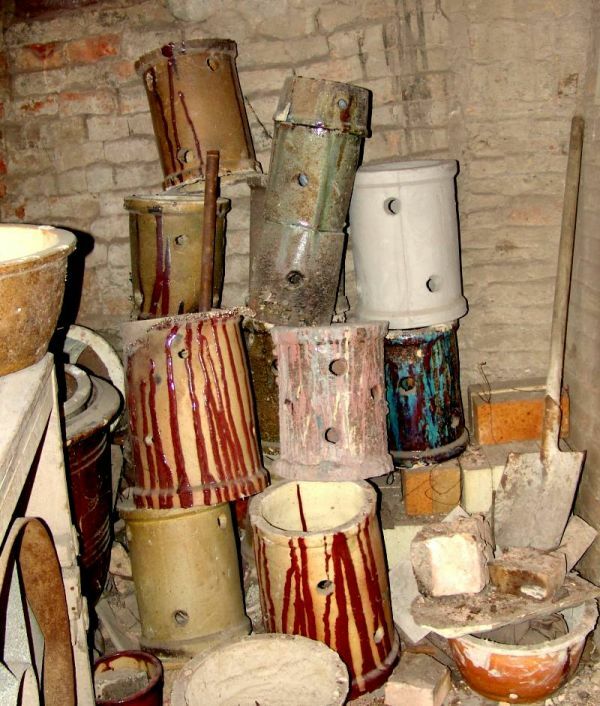 As such, we were fortunate enough to witnessed an ongoing production with the kilns still in use today. Each firing session would take 18 hours, after which it would need to cool for 3 days before starting up a new fire. The woven grass-slippers were used by the workers to unload fired pots when the kilns were still warm. It was also important to work while the kilns were still warm since wet pottery were also loaded into the warm kilns to help them dry before the firing process. According to the workers there, the fire had never been out for 500 years. These were in fact the oldest firewood Dragon Kilns in China. Flower pots prior to firing. The firing pit of the Shiwan 'Nanfeng' dragon kiln, just starting to warm up. Just bricked up door in the side of the dragon kiln, used to load and unload the kiln tunnel. While we never got to witness the actual firing session, the firing session apparently spews fire from many 'dragon fire eyes' along the tops of the kilns. One thing that sets this kiln apart from porcelain kilns is that the pottery that is fired is free standing in the kiln, exposed to fire and smoke. 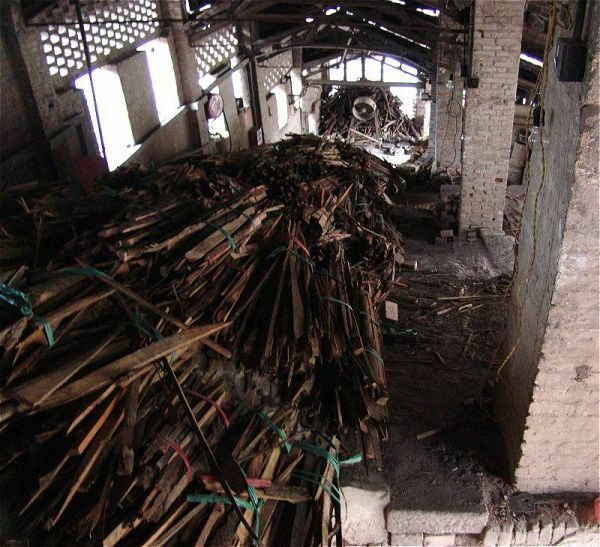 Sticks of firewood were then inserted into the 'fire eyes' along the dragon kilns to aid the firing process. 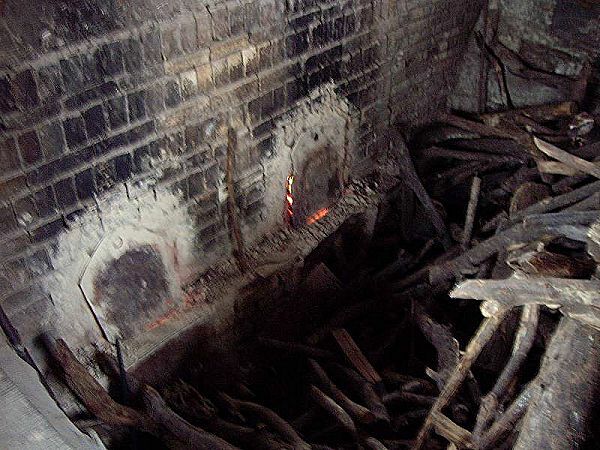 All along the firing tunnel of the Shiwan dragon kiln, the 'Nanfeng', the wood that is to be used for the firing is in place and dried on the still warm tunnel after the last firing. The principle of firing a dragon kiln is that the main fire is started at bottom part firing pit. Then the items closest to the mouth is fired first while the hot air and smoke is led up and out, along the length of the dragon kilns body. Then the furiously roaring fire is stoked row by row of small firing holes gradually climbing upwards along the body of the dragon kiln until the whole length has been fired at maximum heat. This way all items benefits from the preheated air making the firing so efficient that the mass of the items fired can equal the mass of the firewood used meaning that one ton of wood can fire one ton of ceramics. As far as I could understand no protective ceramic boxes - saggars - to keep the ceramics inside during firing and protecting them from sand and soot, was used. The pieces to be fired appeared to be exposed directly to the hot flames. Since the hottest area in the kiln are closest to the roof a number of square or round kiln furniture was used to support larger objects that needed more heat and lift them up to a higher position right under the roof. This would also force more hot air to flow in the lower part of the kiln why these stands were also all fitted with holes to let the hot air flow through. Along the sides of the dragon kilns were stored kiln furniture of various sizes. During firing the heat is highest just under the ceiling, inside of the kiln tunnel why various supports are used to lift up larger objects so that they will be exposed to more heat. The proper placement of the various good in the kiln is one of the most difficult aspects of old time wood kiln firing. 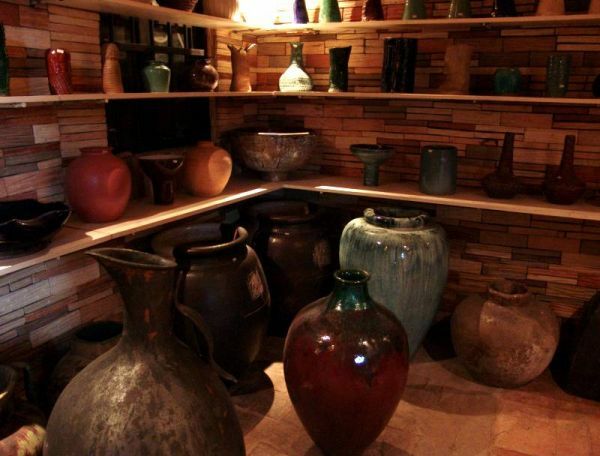 The Shiwan potters say that it takes at least three years for a very talented apprentice to learn how to throw. Imagine the time it would take to learn where to place thousands of variously sized, shaped and glazed pieces inside a kiln tunnel. From what the guide told, a firing here would last for 18 hours and then there would be a three-day period during which the kiln would cool down, the potters would unload the fired ceramics and the kiln being loaded again for the next firing. Even the secondary heat outside the kiln was used for both drying stoking firewood and also to give a number of flat tiles a first baking. During my visit some pottery workers were busy placing unbaked square tiles, maybe for floors, on top of the kiln near the firing box and on top of the kiln. I can't judge how hot this area on top of the firebox would actually become during firing, but it would not surprise me if that would be all these tiles would need. One could guess that this might do for a bisque firing and that they would be covered with a glaze and fired up to stoneware temperature later on in a second step. Stoking holes in the kiln roof. After that the fire have been started at the bottom of the kiln, a wall of flames are nurtured to move up inside of the firing tunnel. The fire is fed long sticks through these rows through which also fierce flames bursts out during firing making the kiln truly look like a very much alive, madly furious dragon, breathing smoke and flames. Our tour ended with the souvenir shop visit and a visit to their in-house provision shop where our local tour guide bought all of us red bean filled ice-cream, red beans being a staple in Cantonese desserts. The treat was much appreciated after the long walks through the kiln site. It was quite fun when moving on to the unavoidable factory souvenir outlet to see the happy expressions with Berit and Anders Wästfeldt among the many figures of the shelves, finding the modern equivalent to the figures they had found in the porcelain shards in the Gotheborg II wreck, more or less still available for sale. It was exciting to imagine how these small figures would have been sent by ships down to the porcelain shops of Canton to be sold to enthusiastic merchants of the Swedish East India Company several hundreds of years ago. In the various exhibition halls, in nooks and crannies inside and around the kiln area numerous interesting pieces was on display and for sale both of traditional designs as well as new. Somehow the Shiwan kilns are the captives of its own success, and variations and new inventions that could stimulate new trade is hidden and mixed in a maelstrom of the mediocre and bland. Unfortunately much too much of the space was taken up by the ordinary and the popular, leaving all too little space for the new and inventive. 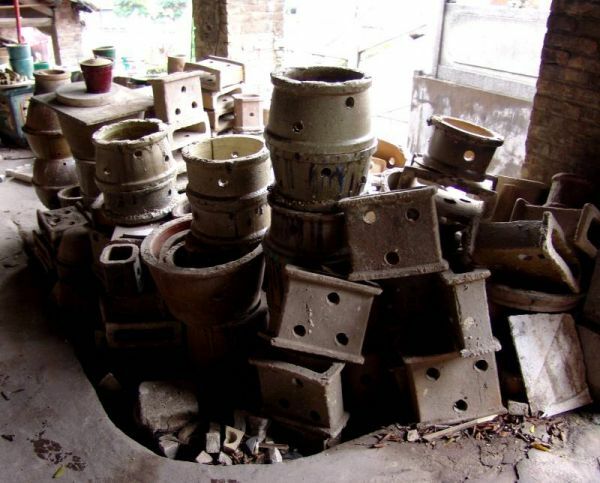 Still the skill and enthusiasm that has kept these kilns burning since the Ming dynasty will certainly help vitalize the trade as well as keeping the old traditions alive. It was an unforgettable moment to visit it and I will do my best to one day be able to return. Small figures very similar to this one which is actually a fully functional whistle were found in the cargo of the foundered East Indiaman Gotheborg during the Wästfelt excavation, showing one more product beside Jingdezhen porcelain in the cargo, and also that the sailors and officers also brought small souvenir pieces made at the Shiwan pottery near Canton to bring home to their near and dear. 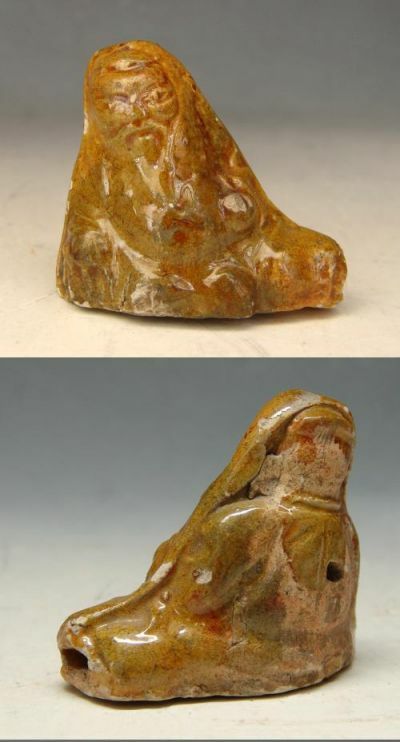 This particular small whistle figure is very similar to those found in the cargo but was found at an antiques market in Shanghai in 1993.